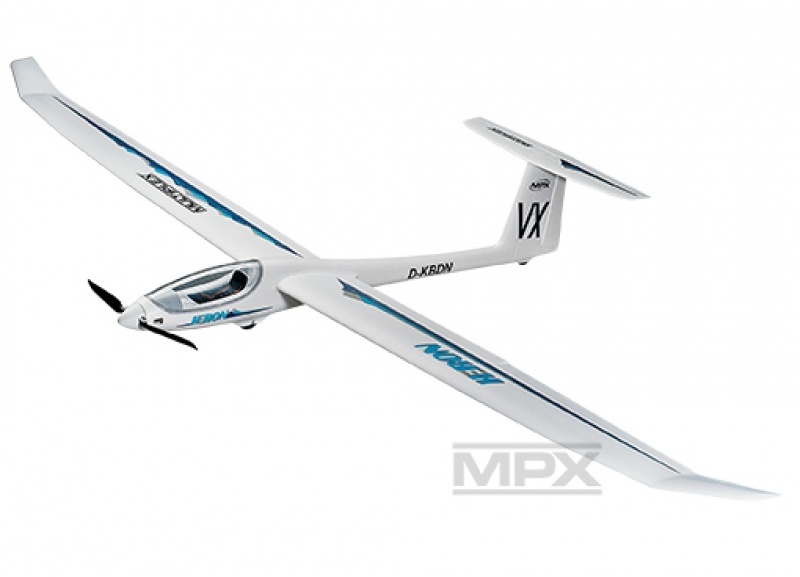 ARF powerful set of thermal or slope of a motor glider with a motor PERMAX BL-O 3516, 40A regulator, 6 servos. Model of highly durable ELAPOR, controlled ailerons, flaps, rudder, elevator. From the first performance at the fair in Nuremberg in 2015 less than a month has elapsed, the snow on the mountains still divided he not, and never can start building the newest gliders from ELAPOR from Multiplex! Heron is the younger brother of the popular glider Solius - since it appears at first glance differ new wing of greater span "mechanization" flaps and ailerons. At first glance slim body with a transparent canopy with cockpit indicated, just the T-tail configuration for easy removal of the horizontal tail for transport. The wing span of 2400 mm with elegant winglets provides excellent strength properties and pleasant behavior at low speeds. The fuselage is made of almost indestructible foam ELAPOR. The secret, which allows you to have a foam body so slim, thin-walled tube is hexagonal aluminum alloy hull reinforcement from the wing after tail. Pipes are also routed extension cables rudder and elevator servos. Bow fuselage and tail further strengthens several fiberglass rods glued between the torso and the tail fin. The bow is mounted brushless motor PERMAX BL-O 3516-0850 with 55 mm propeller cone and leaves 12x6. "Canopy with clear" bubble "is removable, fixed with a pair of conventional plastic locks Multiplex. The bow will find enough space for the controller, the drive battery and receiver. rudder and elevator servos (Nano-S) are stored in kýlovce, rudder control short straight wire rods. The wing of the model of the two-part foam ELAPOR beams of the rectangular tube of aluminum alloy, the projecting portion serves as a coupling wing. Wing halves are secured in place sophisticated pin fitting in locks on the root ribs - the pin is removed and inserted from the cabin. Servos and flaps (Tiny-S) are stored in pits with plastic covers, ailerons and flaps (the length of reinforced thin-walled tube of stainless steel) are controlled independently by two servos with short straight wire rods. The tail surfaces are made of foam ELAPOR also reinforced with fiberglass rods. Horizontal surface is attached to the top of the fin using two screws polyamide. The landing gear is wheeled in "ASW" style, with the main wheel with a diameter of 45 mm and a sliding shoe on the tail. To drive the model used Brushless PERMAX BL-O 3516-0850 40 A controller with switching BEC power stabilizer MULTICON BL40 S-BEC to ensure reliable power supply board electronics with 6 servos. To serve power Li-poly tříčlánek with capacity of 2200 mAh or more with load capacity of at least 20C. The specific type dial so that you without further reweighing best based on the correct center of gravity. To control model in distress make do with ordinary six-channel computer radio system, but the ideal is of course the use of at least seven-channel computer RC kit allows independent control of the aileron and flap servos and two roll mixing butterfly brakes (both ailerons are deflected consistently up and both flaps down) . And it's also able Affordable Flash 7 or Cockpit SX! ARF set contains almost finished model with body, wing and tail surfaces of the foam ELAPOR with assembled motor, ESC and servos 6 and guidance.